The four interlocking circles on Audi vehicles symbolize the combining of four companies that were independent at the time, named: Audi, DKW, Horch and Wanderer. The owner at that time was a man named August Horch and the new mega company was subsequently named after him. 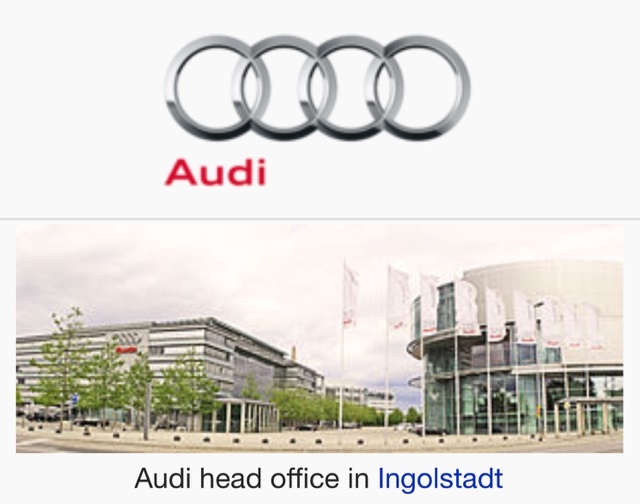 He owned Horch, but created Audi prior to the merger and since he couldn't call the new smaller company by his name, they translated it to Latin and rolled with it (no pun intended). In German Horch means "listen/hear" and in Latin, audi means to listen. So there it was! Each of these four brands were retained and produced vehicles for differing segments of the market. DKW - Motorcycles and small cars, Wanderer - mid sized cars, Audi - deluxe mid sized, and Horch - luxury top end cars. In 1960, Volkswagen acquired Audi and relaunched the brand in 1965. Shortly after VW introduced Audi to the US in 1970, and it is now one of the best selling automobile brands in the world.